Designed for writer's mobility. 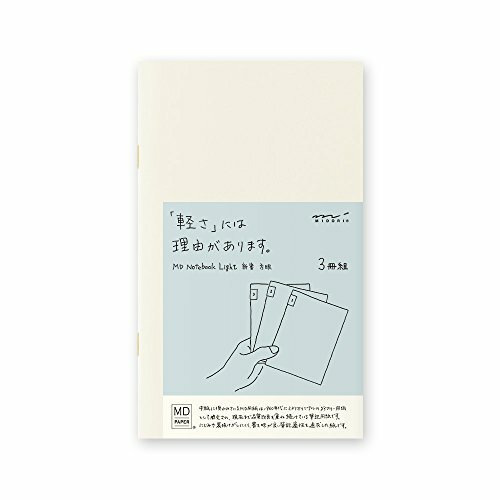 The 'MIDORI Diary (MD) paper' used in this notebook was first developed in the 1960s as Midiri Co.'s (now Desighnphil Inc.) original diary paper and has continuously gone through quality improvement until today. This paper is adapted for high writability. It prevents smearing or bleeding through easily. Pleasures of Writing: Light and thin enough to take along so you can jot down thoughts and ideas on the go. Separated into three thin notebooks the same way a book is divided into volumes, so each one can have its own story. The cream-colered paper is easy on the eyes while creating a beautiful contrast with black or black/blue ink. A modern take on nostalgic Japanese manuscript paper with grid lines.Divisions are placed on the pages to make it easier to count words. If you have any questions about this product by Desighnphil, contact us by completing and submitting the form below. If you are looking for a specif part number, please include it with your message.